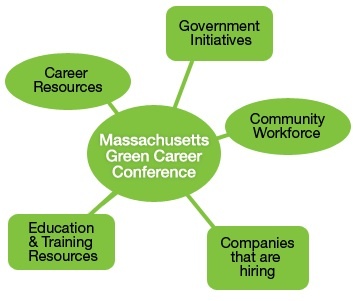 The 3rd Massachusetts Green Career Conference is a forum for stakeholders in the greening economy, a showcase for experts and exhibitors giving green career guidance, a platform for updates and best practices in the greening economy, a place for job seekers to learn, and a networking opportunity for people from throughout the Commonwealth. This is a unique opportunity to reach important constituents all in one place. Local Green Businesses & Careers – Learn about innovative, growing local businesses and green careers. Megan Raye, HR Director of Next Step Living Inc. One-on-one meetings with four experts at the conference at no additional charge. Hear from leading experts about career opportunities and career paths in emerging sectors. Are you looking for a green career in Massachusetts? Are you greening your career or helping others? Listen to experts talk about learning initiatives. Hear from people in business who are hiring. Learn about the latest labor market trends in MA. The Massachusetts Green Career Conference is hosted by Green Workforce Training and Associates and directed by Jen Boudrie, an instructional design expert and a leader of local environmental sustainability efforts. The estimated C02 created by this event from car travel and electricity was offset by a donation to www.LiveCooler.org to install energy efficient lighting in low-income family homes in Massachusetts.